Nine SSL rounds have been played so far. It hasn’t been for a long time the ranking has been looking this exciting! 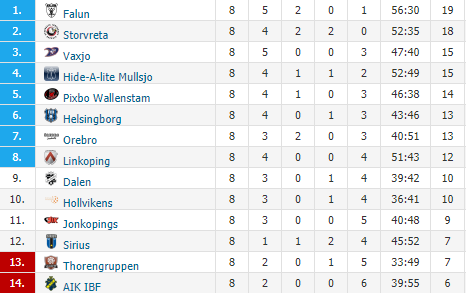 On top of the ranking is Linköping, the only team with 19 points. They’re followed by Dalen, Falun, Storvreta and Mullsjö – all with 18 points! Växjö is at sixth place with 16 points, although this team beat Linköping in Round 1 with 9-1. Dalen beat Storvreta and Falun in the first two rounds, while Mullsjö’s start of the season wasn’t all too well. Only in the last few games, they’ve been climbing the ranking (four victories in a row now). Falun and Storvreta both are two spots lower than last year, while Växjö even is three. Mullsjö is at the fifth place now, only one spot lower than last year around this time. Linköping (+7) and Dalen (+8) are doing fantastically, as we all noticed already. Tonight, Mullsjö can take the lead for at least a day as they play the only game of the day, against Sirius IBK (ranked 10th).